Talks are continuing between troubled retailer Woolworths and its two main banks in an attempt to establish if it is possible to save the iconic chain. 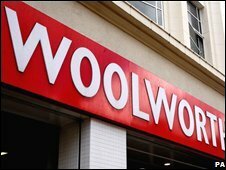 Woolworths has debts of £385m and it is at risk of going into administration. The firm, which employs 30,000 people around the UK, has been suffering as a result of intense competition. Earlier this week, it was reported restructuring specialists Hilco were set to pay a nominal £1 for Woolworth's loss-making retail business. But the BBC's business correspondent Joe Lynam said the banks might prefer to recoup their money by calling in the administrators sooner rather than later. He added that shares in the firm have tumbled by 92% over the past year - falling 32% on Friday alone - as confidence that the company could meet its day-to-day activities, as well as repay its existing loans, started to fade. The general retailer has been struggling for some time as competition from more specialist outlets, large supermarkets and the internet has forced down sales. It has suffered further as the economic slowdown has hit consumer spending. The firm announced a record first-half pre-tax loss of £90.8 million in September and scrapped its dividend to shareholders. In August, it rejected a takeover bid of £50m for its 815 stores from a group headed by the founder of the Iceland frozen food chain, Malcolm Walker. Woolworths has been an icon of the British High Street for almost a century. It also has a distribution business and a DVD publishing business.